The eighteenth century saw the start of the Industrial Revolution which caused major changes to the skills, environment and working conditions of the people of Great Britain. The town of Llanelli's own industrial revolution started when an Englishman crossed the town's Falcon Bridge with a train of wagons carrying his family, his possessions and a large chest of gold. [a] He was to be the catalyst that transformed the town from a small fishing village of 56 houses and a parish church into one of the major coal and steel towns of South Wales. Alexander Raby, 'tall, handsome, high-minded, eccentric, always doing strange acts of kindness'. These are a few of the words used to describe the man by past historians. [b] He was also an entrepreneur, ironmaster and coal baron who came to Llanelli around 1796 to gamble his entire fortune in the coal and iron industries but left in reduced circumstances. Alexander Raby's first connection with the town is said to have begun when he financed John Gevers and Thomas Ingman, two iron-founders who had previously set up an iron furnace on the Stradey Estate in 1791. [c] Little is known about these men, except that they leased some farms locally where there were sources of ironstone. [d] According to early historians, Gevers and Ingman were not successful and were unable to repay Raby who then foreclosed on them and took over the iron furnace in 1796. John Gevers continued to work with Raby at the Stradey furnace and was to be associated with him for many years. Raby had business interests in other parts of Wales including Cilgerran, Neath, Swansea, Morriston, Saundersfoot and in England at Cobham. [e] The great revolution in iron making meant that good quality iron could now be made with coal in the form of coke. For economic and logistical reasons it was necessary for iron manufacture to be sited near the source of its raw materials. Coal was king! Cobham Park 19th Century Image, Dr David Taylor. Gevers and Ingman 1796 Business Card, British Museum. Cobham Park Contemporary Image, Dr David Taylor. The town of Llanelli was already known for its trade in coal. It was probably for this reason that Raby relocated there from Cobham. He worked a number of coal mines on the Stradey Estate, including pits called Caerelms, Caemain and Caebad. Indeed, it was on the Stradey Estate that he centred his industrial operations. The estate was owned during Raby's time by Dame Mary Anne Mansel, who bequeathed it to Thomas Lewis on her death in 1808. Raby's relationship with both these landowners can be described as being, at the least, stormy. As well as building a second furnace at Stradey in 1800, Raby built his home there, in a valley called Cwmddyche, which has been translated as 'pleasant valley' or 'useful valley'. The village later became known as ‘Furnace’. The contemporary plan shows the village, and the principal sites associated with the Raby family in 1814. Alexander Raby's house, named The Dell on the map, was originally called 'Furnace House'. Both his sons, Alexander junior and Arthur, lived close by, Alexander junior at Bryn-mor and Arthur at `Plas Ucha', which was on the site of Cae-mawr Cottage. One furnace, marked Old Furnace on the map, is still extant and was made a Listed Building in 1966 but little has been done to preserve it. Forge Row, Sandy, Llanelly 1800s, John Wynne Hopkins. Iron production required large quantities of coal, limestone and iron ore. Coal was obtained locally from collieries on the Stradey estate and was initially transported by mules and oxen, but Raby had to go further afield to obtain the limestone and iron ore. There were quarries for both on Mynydd Mawr (Great Mountain) 13 miles north of Llanelli. An economic method of transportation was essential to move the large quantities required for the furnaces. Although a canal was initially considered, it was finally decided that a railway or tramway would be most efficient[k] and, as the enormous expense would have been prohibitive to Raby himself, it was decided to fund it by public subscription. A petition was presented to the House of Commons for a railway or tramroad to be constructed from Llanelli to Mynydd Mawr and an Act of Parliament was passed on 3 June 1802 allowing its construction. [l] Its motive power was horse power — although the stationary steam engine was in use, it would be another two years before Richard Trevithick's famous steam locomotive was to run on the Penydarren Tramroad at Merthyr Tydfil. Financial problems continued to plague him and by 1809 he was once again in serious financial difficulty. In October and November of that year his entire iron works and collieries at Llanelli and Neath were advertised for sale in The Cambrian. The sale was to take place by auction at Garraway's Coffee House, London, on 16 November. It was at about this time that Raby was forced to sever connection with his industry at Cobham. Although his failure is generally attributed to his misuse of the Carmarthenshire Railway assets, the onset of his financial problems appears to have occurred in 1803. [u] It was then that he dissolved a partnership with a certain Colonel John Dumaresq, who owned a quarter share in the works and collieries in Llanelli. Raby had, in effect, bought Dumaresq out, on a long-term basis, by paying him fixed amounts with interest. Following the Carmarthenshire Railway enquiry in 1807, Raby's entire concern at Llanelli was put into the hands of trustees. These were Messrs Hammet, Thompson, Day, Handasyde & Birch, who took over management of the concern in 1808. Raby also faced considerable debts from his iron and coal concern at Neath in Glamorganshire, where he was pursued by Lord Vernon for arrears of rent in 1810. [v] By this time, Raby was insolvent. His trustees then took over management of the works, to their great loss, [w] and were probably responsible for the attempted sale at Garraway's Coffee House, which did not appear to attract any buyers. By 1811 Raby's empire had become a 'hot potato'. Raby and son continued in partnership in their iron and coal concern, producing coal for both the home and export markets and manufacturing such items as tram wheels and iron naves for wheels for local collieries. Problems continued to befall the Rabys. Lack of orders for their iron works must have been the reason for the stoppage of the furnaces, which were said to have been blown out by 1815, the same year as the Battle of Waterloo and the end of the Napoleonic Wars. [y] The Rabys now sought assistance from Arthur Raby's brother-in-law, George Haynes, of Haynes, Day, Haynes & Lawrence, a Swansea bank. Along with Nevill and Druce, initially they must have seen the Raby empire as a potential investment for their monies for they continued to support both Alexander and Arthur for some time with the expectation of some returns on their loans. However, Richard Janion Nevill of the copper works had another motive. The copper works relied on the collieries of a certain General George Warde for their supply of coal. 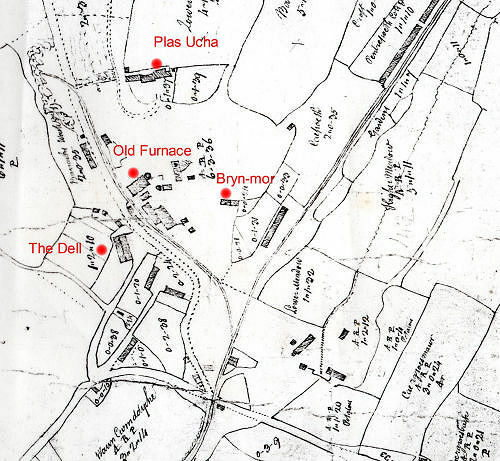 Had Raby gone under, the copper works would have been at the mercy of Warde who would then have had a monopoly of the coal market at Llanelli. Furthermore, had Raby's collieries closed, all his collieries would have sustained permanent damage by flooding, thus reducing any chance of recovering monies owed to the increasing number of creditors who were awaiting payment. The pumps had to be kept going! Raby and his son, now owing very large sums of money to Nevill, Druce, Messrs Haynes and an extraordinary number of workmen, tradesmen and shopkeepers, were forced to hand over their entire concern at Llanelli to Messrs Broom & Guthrie. who acted as trustees for Nevill and Druce. The Rabys were forced to leave the country and spent the next five years travelling to-and-fro between France and Jersey. They finally returned to England and settled at Burcott House near Wells in Somerset where Alexander was said to be 'seen now and then' in the streets of Bath. As he approached the age of 88, the pages closed on Alexander's busy life at Burcott on 24 February 1835. His remains were laid to rest in St Cuthbert's Church, Wells. The passage of time has made it difficult to pinpoint the actual cause or causes of the failure of Raby's industrial empire but historians have put forward various suggestions: the fact that there was an economic depression following the end of the war with France; that the distance from Raby's furnaces to his ironstone mines was too great; that the quality of the iron ore was poor, giving a poor yield (he had been importing ore from Lancashire and Anglesey). It could be that Raby had put all his eggs into one basket. He had restricted his market to the production of tram plates for the Carmarthenshire Rail Road and the supply of armaments to the government, so that when both these markets dried up he had no customers. Recent research by Davies failed to reveal orders for cannon or shot for the Board of Ordnance later than 1805. This may have been because the victory at Trafalgar meant that the threat of invasion was over and lessened the demand for ordnance. Although Alexander Raby's business empire failed in Llanelli, he is credited by most historians as being the pioneer of the town's industrial development. By 1886 the once small fishing village had grown into one of the major industrial towns of South Wales, boasting seven large tinplate works, a large copper works, four large foundries, a lead and silver works, a ship-building yard, three steam-powered saw mills and half-a-dozen collieries which exported 87,500 tons of coal in that year. Now all that remains in the town in connection with Alexander Raby is the ruin of his blast furnace and the name of the village, Furnace, in which it stands. Both are fitting memorials to this great industrialist. For further reading see: Alexander Raby, Ironmaster. Surrey Industrial History Group (2000). Acknowledgements and thanks to: The Surrey Industrial History Group, Glenys Crocker, Dr. M. V. Symons, Dr. J. D. Davies, Dr. David Taylor, Peter Benians, John Edwards, Caroline Streak, Robert Ephgrave, Caru F. James and the staff of Llanelli Public Library. Mr, Mrs D. Thomas of 'Tudor Cottage'. [d] Coalmining in the Llanelli Area (1979) M. V. Symons. [g] Britannia’s Dragon p85 (2013) J. D.Davies pers comm. [v] A Romantic valley in Wales-The History of the Vale of Neath(1925) R.A. Phillips p305. Dr David Davies pers. comm. The South Wales Coal Trade and its Allied Industries (1888) p42, 43. C. Wilkins.